"... Israel's consul-general in Mumbai, Orna Sagiv, said she was "really shocked" by the "insensitive" name. 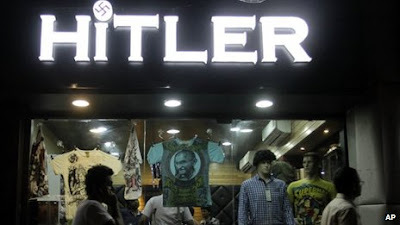 Its owner says he did not know who Adolf Hitler was and the store is named after a business partner's grandfather who was called Hitler for being strict. Mrs Sagiv said she would "raise the issue" with the state government next week during a pre-arranged visit to Gujarat. "I don't think they have named the store out of malice, I think it's just ignorance and insensitivity on their part," she said. The shop's owner Rajesh Shah, who sells men's clothing, said he was surprised he had upset people...."